Plain and simple, product manufacturers and brands must publish and synchronize product data across all their selling platforms, or risk decreased consumer sales and loyalty due to poor experiences. Solid product content is critical for your company’s digital success. According to Gartner, companies face a lot of waste: “Gartner research shows that poor data quality is costing organizations an estimated average of $8.8 million per annum.” This mind-bogglingly massive amount of waste tells us brands are failing to manage the end-to-end experience customers have with their products. Digital consumers expect data to be what they need to know and when they want to know it, regardless of touchpoint. Therefore, brands must integrate – at minimum – a consumer-focused product data and content plan supported by synchronization. This means a few things to your product strategy. Build a better data syndication process. As Gartner says, “Unsystematic and siloed tactical solutions for sell-side data syndication invariably fail to meet data subscribers’ needs for timely and high-quality product data.” In other words, you don’t like your company’s wonky internal process, and neither do consumers. They can see the siloed information ownership and lack of syndication and it’s frustrating. As a result, customer service issues rise and sales fall. Employ holistic thinking. Per Gartner: “Often, organizations approach delivering their product data tactically, with line of business (LOB) departments employing tactical solutions. This will not be an adequate solution going forward and an end-to-end strategic approach is required.” Relying on someone in sales or merchandising to exact a content vision is not reasonable due to tunnel vision. The approach must be company-wide and recognize the shopping journey’s infinite nuances. Expand your product reach. Very quickly and very soon. “Over time, Gartner expects the volume of data needed, and the velocity at which it is delivered, to greatly increase.” We’ve already seen this at Salsify. The big players – Amazon and Walmart – are requesting full product catalog uploads, and fast. Managing these large shifts requires expert knowledge of the industry’s ecosystem via established relationships and turnkey APIs. Master analytics to improve iteratively. According to Gartner, “Gartner has determined that poor data quality alone is a primary reason for 40% of all business initiatives failing to achieve their targeted benefits.” The foundational layer of this statement is solid product content. The next layer is researching and analyzing how that content is consumed along the shopping journey, then making each line more intuitive in meeting consumer needs. Invest in personalization. Consumers want to feel exceptional, making personalization – above a website greeting – essential. Upon entering words into search bars, whether on a website or within a browser, consumers are expecting instant content tailoring, receiving only the products they care about and the content they need to see based on their search terms. To accomplish this, the product dataset should be smartly structured based on search and selling analytics. The consumer product experience is now more than the surface content on the site page. To improve your product strategy, identify the gaps between products with the basic, requisite details and those with exemplary shopping experiences. Next set up a workflow and select the technology that will help you close these gaps and optimize product content and syndication across all your major selling platforms. Looking for more advice on how the best brands are keeping pace with digital change? 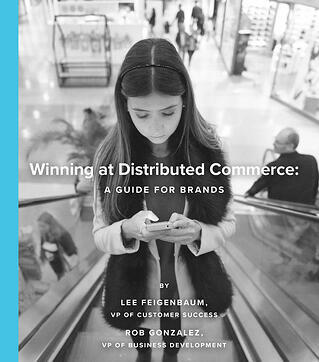 Get your free copy of our comprehensive white paper: Winning at Distributed Commerce.